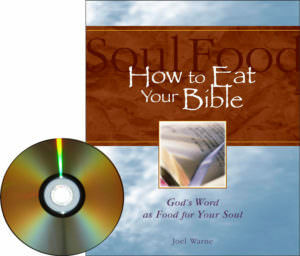 With humor and practical insight, Joel Warne teaches nourishing methods of Scripture meditation that help participants move across the divide from knowing about God to knowing God. 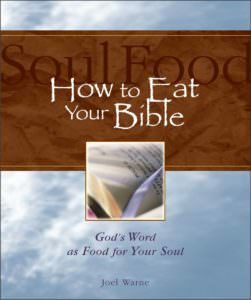 This video-based small group / classroom resource teaches simple yet transforming methods of reading and reflecting on Scripture that help readers taste, savor and digest God’s Word. This participant guide includes inspiring classic quotes and prayers from the Scriptures, key Bible meditation methods, tips for Bible reflection difficulties, quiet time aids, passages for at-home reflection, room for notes, a format for ongoing Scripture reflection groups and more. 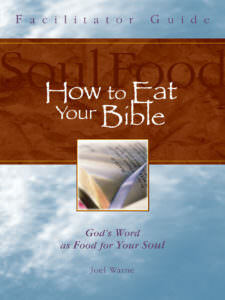 The How to Eat Your Bible Facilitator Guide includes full outlines, materials, and leader tips for each session, plus a format for optional ongoing Bible reading groups after the course concludes. Your illustrations captured our attention, brought us to uproarious laughter, and drew us into a wonderful conversation with our Lord's Scripture. Deep enough for the seminary student, accessible enough for the absolute beginner. We are loving this method...I've only facilitated two classes but it is getting rave reviews! It's awesome! The people are lovin' it!